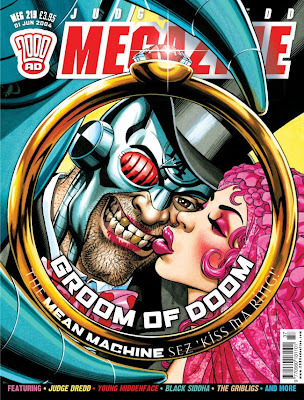 Mean Machine is the one-notiest of one-note characters, and a lot of the stories involving him have a nearly identical arc: 1) Can he be reformed? 2) Nope. (Bok!) So a lot of this volume is rather samey, if entertaining; I can't imagine there was a broad outcry for a Mean retrospective, but as someone who's immersed in this stuff I'm happy to see it. "Travels With Muh Shrink" (the title has to be a play on Graham Greene's Travels With My Aunt) appeared beginning in May, 1991; it was the first that had been seen of the character since "A Merry Tale of the Christmas Angel," more than five years earlier. Who knows why John Wagner decided to turn his attention back to Mean? Maybe this serial was meant as a way of getting him back on stage before the long-in-the-works "Judgement on Gotham"; maybe it was planned as a feature for the Megazine at some point; maybe it was Wagner keeping his hand in the Dredd universe while Garth Ennis was ramping up to speed. It's not one of Wagner's more successful comedies, because it doesn't build like those do--it's more or less just one gag after another. Which reminds me: is the bit about the Reliant Robin and the Snoopy sweatshirts a jab at a particular person, or just a type? 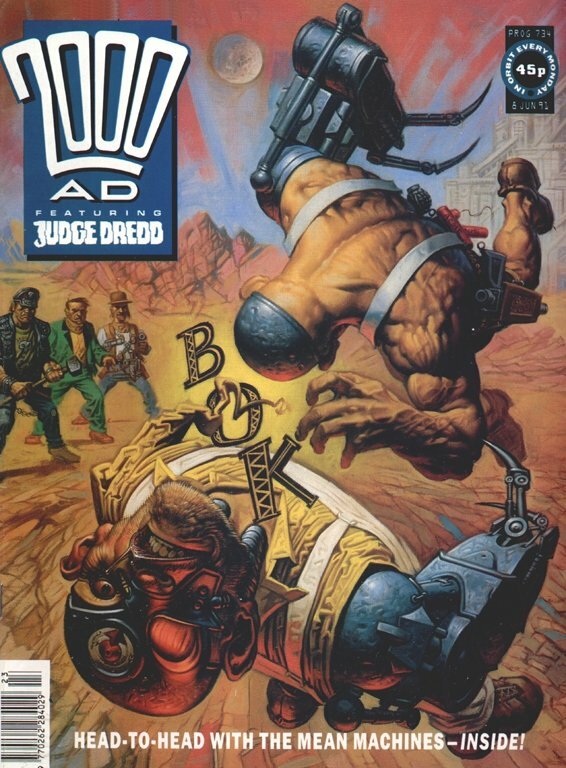 The real curiosity here is artist Richard Dolan, who only ever drew this series and a few covers for 2000 AD; he's both a real talent and a significant mismatch to the material. 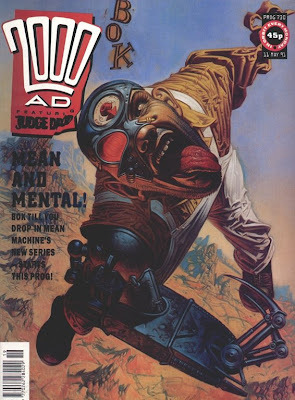 Both Carlos Ezquerra and Ron Smith got the comedic possibilities of Mean--a half-man, half-robot who talks like Yosemite Sam, headbutts everything, and just barely operates on the same plane as everyone else around him. 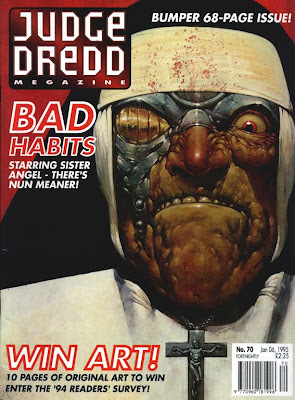 What Dolan's got to offer is the kind of painterly, look-at-my-brush-textures realism that was very popular in that era, in the post-Frazetta mode of Simon Bisley and Glenn Fabry; his characters are clearly modeled, for the most part, on photos. That approach is fine for certain kinds of action comics, but it doesn't work terribly well for funny stuff. So Dolan models a bunch of his characters on photos of the Three Stooges--which might have been funnier if Brian Bolland hadn't already used the same trick way back in "The Face-Change Crimes." It also means that Prof. Dingbert always looks like Curly Howard, which yanks me straight out of the story every time. More subtly, he's always occupying a different physical space from Mean--even when they're on panel together, they don't quite belong in the same place. And the larger-than-life slapstick bits ("Butted him clean through to th' next page!") don't get over on cartoon logic like they're supposed to, because Dolan's art keeps trying to ground everything in real-world physics. "Son of Mean" is a much funnier story than "Travels," mostly because it does build up to Junior's transformation, but the painted/every-wrinkle-indicated technique is odd here too: this is effectively a cross between several Looney Tunes staples, a Sylvester-and-Sylvester-Jr. cartoon with the elder cat replaced by Yosemite Sam (and the business with Junior and his doll is a little like the "and I will name him George" bit from "Hoppy Go Lucky"). The "let's run through all the possible crimes alphabetically" routine is straight Chuck Jones territory. (I laughed at the "arsin' about" joke, although it's a rare example of a Britishism in the mouth of this very American character.) Critchlow recognizes that Mean is a caricature, and so's his (never named!) son; the gag on the second page with Mean holding exactly the same scowl for seven straight panels wouldn't be funny if he looked more ordinarily ill-tempered the way he does in Dolan's artwork. 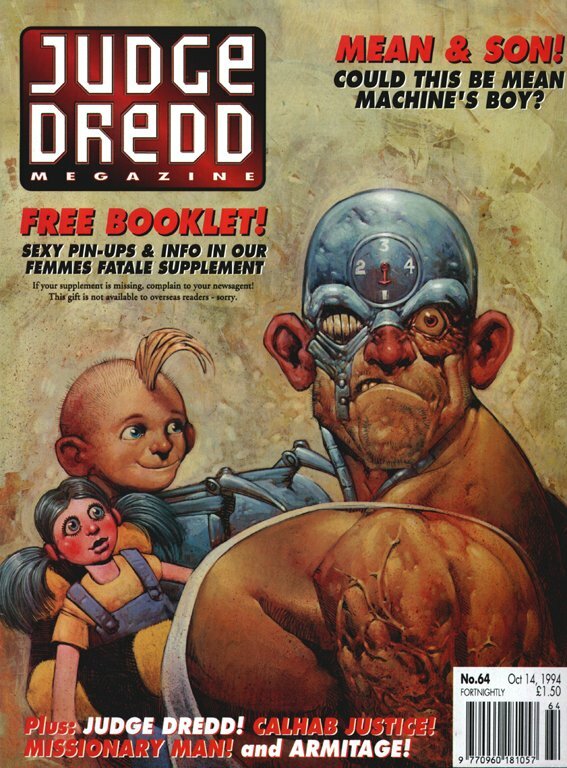 Critchlow's design for the kid is over-the-top moppetry, with neotenic features and that little sprig of hair. It's effective as comedy, although it's a stretch to fit into the "real timeline" feature of the Dredd universe: Mean's son is clearly written and drawn as being about seven or eight years old. One bit of dialogue says he's roughly 13, which is the youngest he could possibly be, given that he was conceived before "The Judge Child" and this story ran in 1994. (Seven-Pound Sadie and the shotgun wedding appeared in Alan Grant and Robin Smith's Mean Machine story in the Judge Dredd Annual of 1983; Grant and Smith had also done a Mean Machine piece in the previous year's Annual. Wouldn't it have been fun to see those here instead of another reprint of "Merry Tale of the Christmas Angel"?) Mean Jr. does turn up again in a panel or two of "Fifty-Year Man" in 2007, clearly an adult but too far in the background to estimate his age clearly. David Millgate's interpretation of Mean seems a little off, and not just because he's got the "1" on his dial at the 9:00 position rather than the 6:00 position where everyone else draws it. Most of "Angel Heart" is a very broad comedy (is Cyberfreak supposed to be a parody of generic early Image Comics cyborgs? ), and Millgate plays it in a kind of post-Tank Girl style, with sharply angled chunky lines and little fourth-wall-breaking sight gags all over. The visual problem is sort of the opposite of "Travels With Muh Shrink": Millgate's artwork here isn't nearly grounded enough in a recognizable world--the wackiness of Mean's outsize gestures and presence don't contrast with anything, it's all pitched up all the way--and when the comedy peels away in the final chapter, it struggles to get the tonal shift across. Bibliographic notes: believe it or not, this isn't anywhere near the whole Mean Machine solo canon. 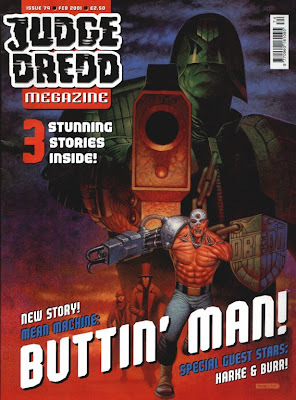 Besides the aforementioned Alan Grant/Robin Smith stories in the early Judge Dredd Annuals, there are other Wagner-written stories in a Poster Prog (with some nice Cliff Robinson art) and Megazine 2.82, and Gordon Rennie-written stories in 2000 AD Sci-Fi Special 1995 and 1996, Judge Dredd Mega Special 1996, and four other issues of the Megazine. 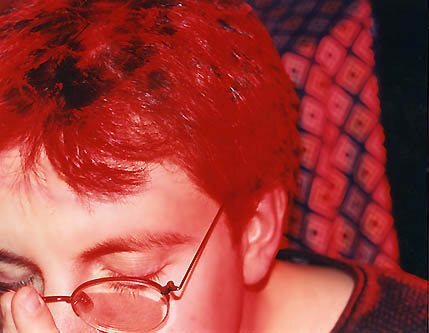 Next week, we turn our attention briefly to Young Death: Portrait of a Superfiend. But wait--didn't we cover that already a few weeks ago as part of Judge Death: The Life and Death of...? Well, almost. You'll see. I thought the last appearance of Mean Machine in that 'Fifty-Year Man' story was actually quite touching. 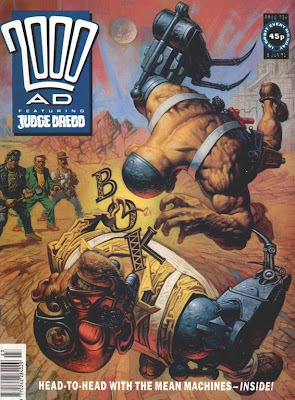 It's taken decades to get used to the idea of Dredd getting old, but seeing the Mean Machine shuffle off the stage like that was just so beautifully understated. That said, I could also totally see Wagner doing a 'Travels With Muh Grankids' series somewhere down the line. 'If somewhere in the deepest recesses of Mean's heart there remains the merest vestige of the young boy who once loved to sniff flowers and cuddle bunnies, you won't read about it in this story'. You can't say Wagner doesn't let you know exactly where things are headed. Mean's a one-note character, alright; his monomania means he can't think of anything starting with 'B' other than 'Buttin', and all the gags come from Mean's overly literal misunderstandings of others' remarks. Like your Dad's rotten jokes, their entertainment value lies in the anticipation of what you know is coming- through long familiarity- finally being delivered upon. When Critchlow finally gets an entire page to show Mean standing over the smear of offal that was once Dr Ramsbottom, declaring "I said I was Gonna but him down ta a greasy spot" (which he does promise to do at least once an episode) "an I did", it's a satisfying payoff that perfectly reflects the form of the story and the character's unique appeal. The dopey couple in matching unisex leisure wear actually make me a little nostalgic for the days when people made their own horribly misguided fashion decisions, rather than copying the branded clothing and generic tattoos of their favourite celebrities. I don't think those two are a reference to anything other than things that get John Wagner's goat, but the Reliant Robin is a well-worn comedy staple (see perennial UK telly favourite [i]Only Fools And Horses[/i]). If you replaced the Robin with a Citroen 2CV, then they'd make a pretty good parody of the soppy Campus Couples I remember from that period. Undergraduate life certainly gets it tight from the self-educated Wagner around that time: fratboy prankery had already been the subject of [i]Hottie-U[/i] and [i]TWMS[/i]'s lecture halls and misguided academics soon resurfaced in [/i]Time Machine[/i]. Since Wagner's kids would have been of college age around that time, I'm inclined to see those stories as a result of the same process that led weight gain ([i]League of Fatties[/i]), the effects of age ([/i]In The Bath[/i]), and idiotic Son-in-Laws ([/i]Simp[/i] and the early PJ Maybe tales) to feature in the Dredd strip as they entered Wagner's own life. The name of the (oddly priapic) hospital chosen for Junior's neurosurgery takes its name from celebrity brainbox and New Labour Peer, Lord Melvyn Bragg; whose beaming countenance can be partially glimpsed in the portrait behind Dr Flunt's desk. As well as being ennobled by Tony Blair, everyone's favourite self-made grammar school boy has been beatified by John Wagner- which might be a sarcastic reference to the fawning coverage the impressively coiffured Arts broadcaster receives in the broadsheet press. That's right Wolk, we have public intellectuals here; try not to be jealous. I took Cyberfreak to be a parody of DC's not-very-imaginatively-named Cyborg (although the term was less commonly recognized at the time of the character's creation by Marv Wolfman & George Perez). Sure, Mean is a one-note character. That's expected. Can he be reformed? Apparently yes, if only temporarily, and by means of hypnosis or an internally-implanted electroshock-therapy device called a "Warden". 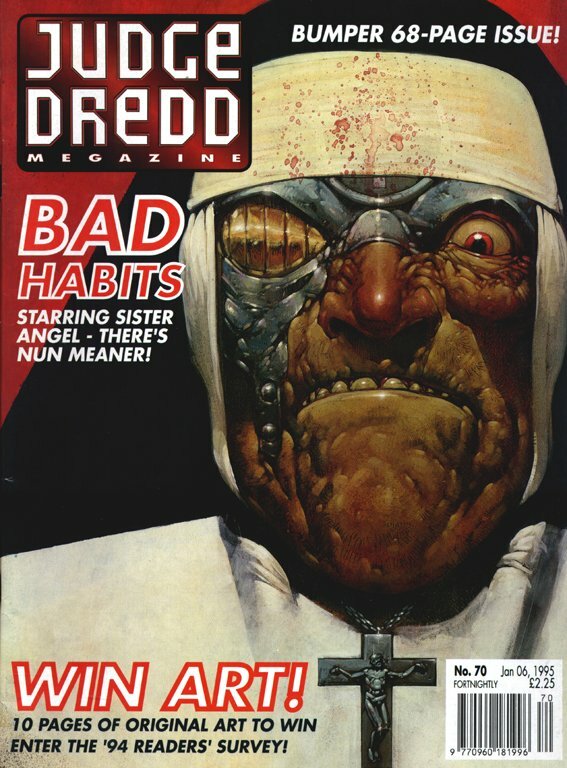 Yet you get the impression that there was another Mean still-existent deep down inside, the misnamed one that he was as a 12-year old child, before Pa Angel's tampering created the adult Mean Machine that we're all familiar with now. Wagner plays on that theme at least thrice here. First, in "Travels With Muh Shrink" where hypnosis temporarily reverts his personality to this 12-year-old persona; next in "Son of Mean" where Mean takes on the role of "Pa" to Junior Mean's original 12-year-old Mean Angel; and lastly in "Angel Heart" where despite the Warden's prevention of Mean's violent streak, when he does act, it's out of a sense of protection to his now-beloved Porsha -- so apparently he is capable of feeling and returning love, remarkable as that seems -- and this is reinforced by his ultimate rejection of Porsha's love for him out of a sense of sacrifice, and for her own well-being. For a moment there, Mean shows almost a kind of nobility, which is touching... he genuinely cares for Portia, and realizes she's too good for him, so he rejects her to protect her. It's almost a bit sad to see him fade into obscurity as an aging, now-lobotomized husk of his former self, rather than to go out in the violent style he lived most of his life, as we expected.